"It seems that politicians over here seem to be determined to bring about the economic collapse of the UK," the guitarist says while discussing the lyrical themes of his latest album. 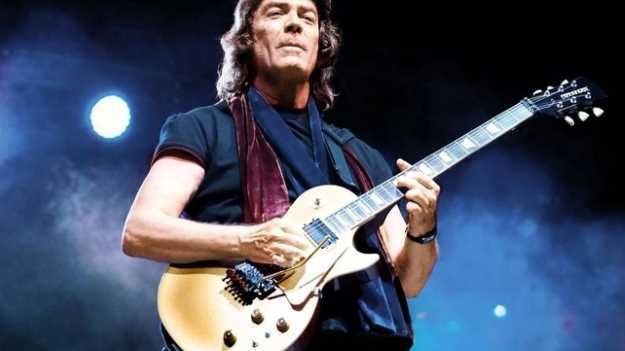 During a conversation with Kyle Meredith, classic Genesis guitarist Steve Hackett talked about the current state of the world, his new album "At the Edge of Light," and more. You can check out a part of the interview below (transcribed by UG). Steve Hackett (SH): "Well, I think so, yeah. I mean, we're at a very dark time in Europe right now. I'm supposed to be touring in Europe a month after Brexit is supposed to happen - some of us are trying to frustrate that process so that we stay friends with our European allies. "I'm trying to erect a German record company. We've buried the hatchet a long time ago, but it seems that politicians over here seem to be determined to bring about the economic collapse of the UK and just try to do what we can without blowing up the houses of parliament, you know. "We don't really know what we can do other than doing an album like this, which shows that people can get on from everywhere. We should be celebrating the best in the world in every field, it seems to me. "Not being idealistic, but we're trying to to get rid of diseases and economic hardships, famine, and all that stuff. It isn't going to happen unless we put out heads together." SH: "It's a ballad - it starts out that way, but it grows from there. The things that precede it - the two tracks - there's 'Dissent,' and then there's 'Conflict,' they all run as three tracks, so you get a feeling of a build-up, almost like a kind of arming feeling. "So you go through armament, the build-up of tensions, and then it's a sort of musical depiction of an all-out war, and then you get this resolving peaceful thing that's got a spiritual aspect about it as well." KM: America is represented here as well, I mean, you wrote about the Underground Railroad - what inspired you there? "I thought, 'This has to make a song.' So I've met the McBroom sisters, both of them have incredible voices, I said I wanted to do something that had a kind of a Gospel feel to it, something that's pure Americana with harmonica and dobro - and all that stuff - so they give it a kind of vocal authenticity that I doubt I could bring to it solely my end." SH: "That's right, I'm doing the whole 'Selling England By the Pound,' certainly most of 'Spectral Mornings,' and introducing stuff from the new album. "So I hope that we'll get a chance to do maybe half an hour's worth from the new album and also with the 'Selling England,' use a song that was, like, a deleted scene if you think of it as a film. There was something that Peter Gabriel and I wrote, so I've been doing that live as well." You can check out "At the Edge of Light" below.